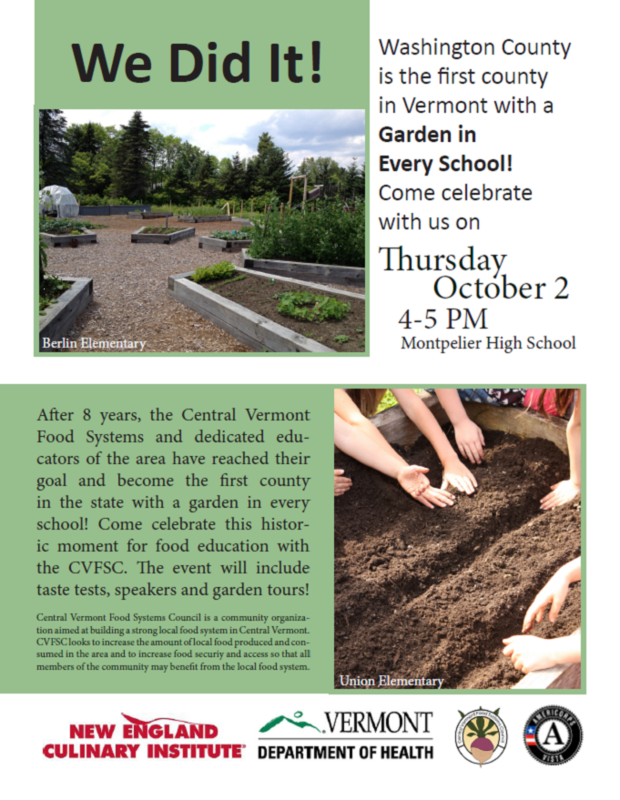 Central Vermont Food Systems Council will celebrate the accomplishment that Washington County has become the first county in Vermont to have a garden at every school this Thursday, Oct. 2 at Montpelier High School (4-5pm). Join CVFSC in marking this important milestone! State education secretary Rebecca Holcombe will address the gathering. The Central Vermont Regional Planning Commission is hosting a public information meeting regarding the installation of centerline rumble stripes on VT Route 100 as part of the current Waitsfield-Moretown-Duxbury Paving Project, on selected sections North of Waitsfield Village in Waitsfield, and selected sections in Duxbury. None are being proposed for Moretown. Vermont Agency of Transportation (VTrans) officials will be on hand to discuss the benefits of centerline rumble stripes, why they are a cost-effective safety improvement for VT Route 100 and to review the proposed locations. Download a Centerline Rumble Strips Factsheet. The Planning Commission will host a Public Forum on September 18, 2014 to discuss proposed changes to our Flood Hazard Area Regulations. In response to costly flood damage over the past several years, the state Legislature recently passed a law offering increased disaster relief funding to towns that adopt new and more restrictive land use regulations in flood plains and river corridors. The East Montpelier Planning Commission has been studying how our current Flood Hazard Area Regulations (Article 9 of the town’s Land Use & Development Regulations) would need to be revised to take advantage of these incentives and to decrease the likelihood of flood damage in the community. The Planning Commission, with assistance from the Central Vermont Regional Planning Commission, has drafted changes to the Flood Hazard Area Regulations. An informational public forum on flood hazards and the proposed revisions to the Flood Hazard Area Regulations will be held on September 18th at 7:00 pm at the Emergency Services Facility Public Room (Fire Department). All residents are welcome. Download a brochure on Local Flood Hazards in East Montpelier or visit East Montpelier’s Flood Hazard Information page for more information.